Dr. Samura Mathew Wilson Kamara was born on April 30 1951, in Kamalo, Bombali District. He holds a BSc in Economics from Fourah Bay College, University of Sierra Leone (1972). He received a Masters Degree & PHD from the University College of North Wales, Bangor. From 1991-1994 he worked in the Economic Affairs Department of the Commonwealth Secretariat in London as Senior Economics Officer. In 1996 he was appointed to serve as Financial Secretary at Sierra Leone’s Ministry of Finance by then Head of State, Julius Maada Bio. When he left that post in 1997 it was as Minister of Finance. In 1998 he returned to the Secretariat in London where he served as Chief Programme Officer until 2001. From 2001-2006 he served as Financial Secretary at the Ministry of Finance and International Development on appointment from President Tejan Kabba. When his tour at the Ministry ended he moved to Washington D.C. where he spent a year as alternative Executive Director for Africa Group 1 Constituency at the International Monetary Fund (IMF). In 2007 he was appointed Governor of the Bank of Sierra Leone by President Ernest Koroma. He left that post to lead the Ministry of Finance in 2009. Three years later in December 2012, he was appointed as Minister of Foreign Affairs & International Cooperation. 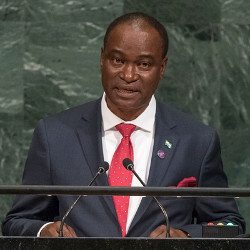 In 2015 Dr. Samura was endorsed by President Koroma to serve as president of the AfDB, a bid that he did not win. He retained his position at the Ministry of Foreign Affairs and International Corporation (MFAIC). On the 15th of October 2017, President Koroma announced at the All People’s Congress (APC) National Delegates Conference in Makeni that he had chosen Dr. Mathew Wilson Samura Kamara as the Presidential Flag bearer for the 2018 Elections. Dr. Samura is married with three children.